What the heck is a yurt? In a nutshell, it's the original tiny house on wheels minus the tires. Traditional yurts are round tent-like structures engineered to collapse, pack and assemble quickly for easy transport. Back in the 1970s, yurts caught on with counterculturalists and hippie homesteaders because they were relatively easy and cheap to DIY. Thousands of years earlier, they were the tiny houses of choice for Eurasian tribes and badass warlords like Attila the Hun and later Genghis Khan. In fact, yurts are still the primary dwellings for Mongolian nomads across Central Asia. These days the humble yurt is experiencing a surge in popularity because of its low building costs and teeny environmental footprint. Are you thinking about becoming a modern nomad? Here's a list of our seven favorite yurt builders. Each one sells prefab kits that you can assemble. Many modern adaptations of the traditional yurt have collapsible wood frames and packable fabric walls just like their ancient ancestors. The truth is, fabric walls wear out quicker than solid walls. Mice can chew through them—heck, they can even fail during a severe windstorm. That's why many manufacturers say fabric walls require regular maintenance and even replacement to keep a traditional yurt in tip-top shape. The Yurt Cabin, by Freedom Yurt Cabins, is a traditional yurt without the shortcomings. The tiny round portable house comes with solid walls engineered for longtime durability. It can be assembled and disassembled in hours just like it's conventional counterpart. Even better, each Yurt Cabin comes with features that you'll never find in a standard traditional yurt, like double-hung glass windows, insulation and integrated flooring. Prices start at $17,995. All yurts have windows, but it's the dome, the crowning glory on top that allows daylight to fill the interior. That's why it pays to have a quality dome skylight. The one on this dwelling by Colorado Yurt Company is weather and UV resistant cell cast acrylic. It's a crystal clear material that's also both impact and chemical resistant. All of their prefab building kits are made to order. Wish you could add another floor to your home? A lightweight yurt can add additional indoor space on top of an existing permanent structure like a detached garage. If you ever stayed in a yurt vacation rental chances are Pacific Yurts built it. When they opened for business in 1978, they became the first modern yurt company in the world. Their standard prefab yurt packages are suitable for mild climates and feature architectural fabrics engineered to meet structural and performance requirements typically reserved for building materials. Solid wood door, clear vinyl windows, and dome skylight are also included. If you want an all season yurt that can withstand winter weather you'll need a few fortifying features that you can add to your package using The Yurt Builder 3D pricing tool. It will also allow you to customize your yurt based on size and exterior colors. Structural upgrades that are available for an additional cost include energy efficient glass windows, gutter systems and snow ​and wind kits. Prices start at $5,475 for a 12-foot diameter standard yurt package. Who says a yurt has to be portable? This tiny house was built on a concrete slab using a yurt shell kit by Smiling Wood Yurts. Each kit includes all the materials you need to create a finished tiny house shell. Doors and windows preinstalled into the walls. Exterior trim package to create a finished appearance for outside corners, windows, and door. Roof kit including the skylight dome. FYI, insulation and flooring are not included. Prices start at $20,283 for 20-foot diameter yurt with 328 square feet of interior space. The only yurt worthy of Neiman Marcus' annual Christmas Book was by Rainer Yurts. And it makes sense. Every structure they create is lovingly "manu-crafted." It's a term the folks at Rainer coined that sums up their unique manufacturing process that combines state of the art technologies with classic craftsmanship. The company sells three types of prefab kits, each one named after a different bird. Prices are available upon request. The Sparrow is a pint-sized budget yurt built for temporary locations, like campsites or your backyard during the summer. One person can put it together. The Raven is an economical housing solution to use on the go or as a guesthouse. It's a premium yurt with a moderate price tag that's constructed to conform entirely to International Building Codes. The Eagle is a hardy yurt engineered for extreme weather like snow and wind storms. It also features an innovative modular wall system for changing window positions. Four season yurts need to be stronger than the three season kind, especially in areas where extreme winter weather is typical. Adirondack Yurts, based in New York creates kits for modular wood paneled yurts that say are better suited for the Northeast climate than traditional fabric walled yurts. The standard yurt shell kit is for creating a livable space. It includes all the pre-cut materials needed to create a finished exterior except for insulation and yurt platform. Kits are available in four different diameters: 14-feet, 20-feet, 24-feet, and 31-feet. The simple yurt shell kit is a temporary shelter. You can use it on short camping trips. It also makes a cool trade show booth. Kits are available in two different diameters: 12-feet and 14-feet. All the kits are made to order. A simple yurt shell starts at $6,700. 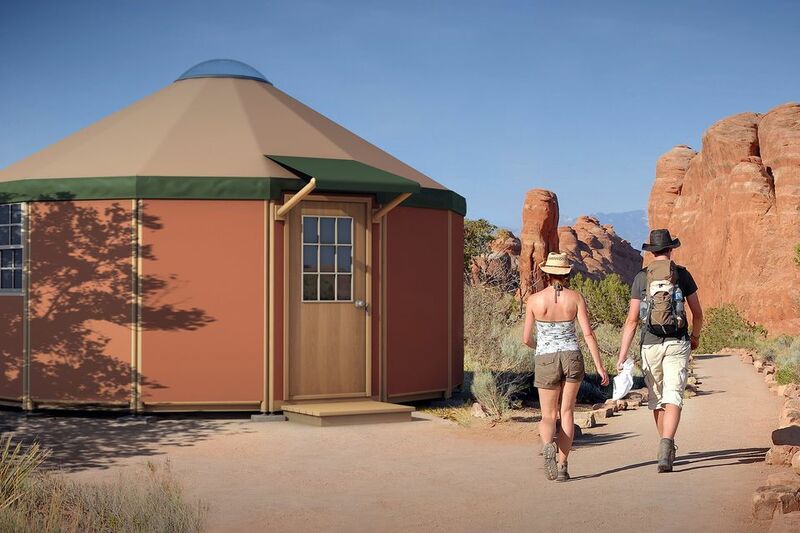 A standard yurt shell starts at $20,800 each. Trakke is a handbag company based in Scotland that sells The Jero Shelter, a glamping-worthy yurt that ships flat-packed and ready to assemble.